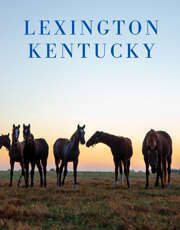 LEXINGTON, Ky. - VisitLEX recognized 34 people representing 24 meetings/events as Hometown Hosts today at a luncheon at the Hyatt Regency Lexington. Developed by VisitLEX in 2004, the Hometown Host Program provides support and resources to anyone in Kentucky who can influence and be instrumental in bringing meetings, conventions and events to Lexington. VisitLEX&apos;s goal is to make the planning process easier for the Hometown Host by providing meeting and hotel options, specialty venue ideas, and organizing first-class site visits. These Hometown Hosts were responsible for bringing more than 23,000 visitors representing more than 25,000 room nights to Lexington. In addition to being named Hometown Hosts, garden designer Jon Carloftis and Dale Fisher, general manager and partner at Jon Carloftis Fine Gardens, received the first ever "Share the LEX" award for all they do to help promote Lexington. They frequently host cocktail parties for visiting journalists and take VisitLEX materials with them to hand out when they are on the road working gardening events around the country. Hometown Host recipients included Senate President Robert Stivers, who brought more than 1,200 people to Lexington for the Southern Legislative Conference, former UK basketball player Jared Prickett and more than 20 University of Kentucky faculty and staff members. These Hometown Hosts brought meetings and conferences to our community in areas such as health care, education, agriculture, and engineering. "Because of these Hometown Hosts, we attracted many meetings that might not have selected Lexington without their help," VisitLEX President Mary Quinn Ramer said. "They serve an important role not only in tourism and conventions but also in exposing so many visitors to the tremendous attractions that Lexington has to offer."